Image Below Or Add To Cart Walther P99 Blank Gun FRONT FIRING Black; We have P99 Blank Firing Guns back in stock! 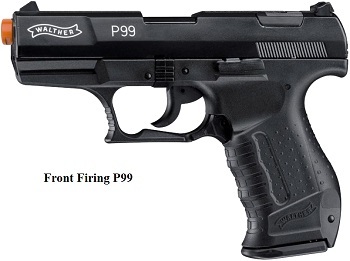 Our New Front Firing P 99, YES Front Firing, Blank Firing Gun is fully licensed by Walther. Our Front Firing P99 Blank gun is an actual Walther product so it comes with fully licensed Walther P99 trade dress and logo on the Barrel. The P99 Blank Firing gun Front Firing Model is the same model gun used by James Bond 007 in one of the latest Bond movies. The P99 is the latest double action design from Walther. It features a polymer frame, loaded chamber indicator, decoking button, ambidextrous magazine release and a new “Anti stress trigger mechanism”. It has been crafted to precise specifications and meets Walther’s strict quality control specification. This eloquently detailed Replica Blank Gun is exact in every way to the original Walther P99 except, like all of our blank guns; it can not fire or be modified to fire a projectile (bullet). It ejects and reloads automatically just like a real hand gun, as do all of our automatic Blank Firing Guns. Our P99 Front Firing Blank Guns is great as a movie, film or stage prop blank gun as well as police and other law enforcement and military training drills, Firearms Training instructors blank gun as well as a Blank firing gun for Collectors. Features are: Caliber 9mm PA, Length 7”, Weight 1.45 Lbs, Capacity 15 Rounds: Manufacturer: Umarex: Country of origin: Germany. It comes with a Hard-Shell Carrying case and a Magazine: Front Firing Walther P 99 Blank Firing Gun Replica Black.